The direct band gap of these materials means that a greatly reduced thickness of material, 2–5 μm, was needed compared to Si, 100–400 μm. This reduced thickness leads to greatly lowered requirements for crystalline quality in the solar absorber, it opens the door for a wider variety of possible production routes ; lowering costs and increasing throughput. 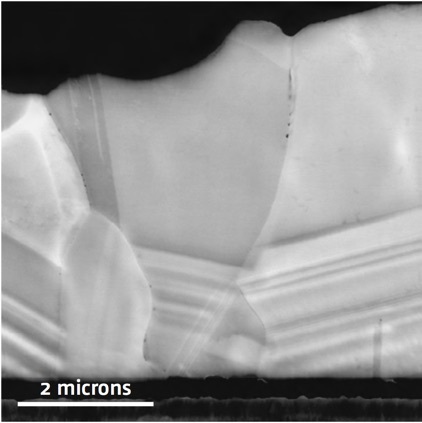 Defects such as grain boundaries and dislocations can be analysed with regard to both their signal intensity and their cathodoluminescence spectroscopic profile. This can provide information about both the electrical activity of the defects and any chemical segregation effects. 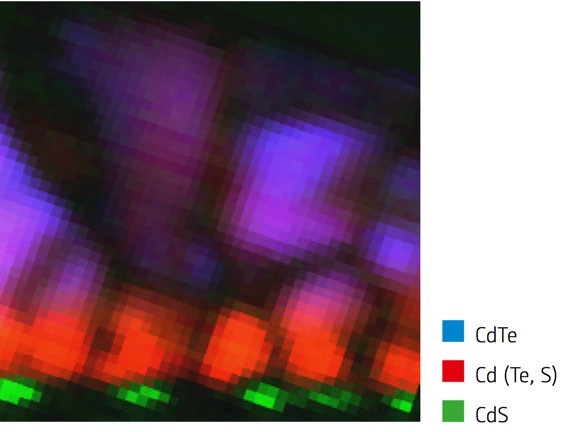 The highly stable cooling stage allows high-resolution scans down to 10 K, giving information about the spatial distribution of dopants and defects levels. Additionally, the tem perature dependence of excited states can be determined, giving activation energies for these states. The local measurement of CL emission lifetimes provides unprecedented characterisation of defects and composition gradients ; carrier lifetimes are an important factor in PV where they must diffuse to the contacts in order to be collected.